Made-from-scratch vs. Made-from-scratch – Leadmine Pond Productions, Inc.
My wife and I were invited to enjoy some homemade cooking one Sunday afternoon. We were told they would be serving sweet and tangy baby back ribs with rice and beans, cornbread, and a Caesar salad. If you've ever made baby-back ribs then you know, regardless of any specifics, there is a process and a method to making tender, fall-off-the-bone ribs. We wondered what our neighbors' process would be. Likewise, there are countless ways to season beans and rice. Again we wondered what flavors we were going to be treated to. Cornbread can also be tricky. You can go for the old school cornbread made entirely with corn flour, which tends to be somewhat gritty. Or you could offer a kinder, gentler cornbread made with both corn flour and all-purpose flour. We like both but prefer the latter and wondered what our neighbors preferred. As for Caesar salad, most recipes are pretty straightforward. Where Caesar salads often vary is on whether or not they have anchovies. In my opinion it's not a Caesar salad without them, while my wife concedes the point, she prefers them on the side where she can flip them off her plate altogether. When we arrived, six pack of Vienna Lager in hand, we had to consciously refrain from dropping our jaws, widening our eyes, staring at each other and smirking. With concerted effort, we managed the obligatory "oohs" and "aahs" commonly exchanged whenever one was served a homemade meal. Our gratitude was received with enthusiasm. While we were concealing our shock, our hosts were popping TV dinners in and out of a microwave oven. Each plastic tray was a complete entree of barbecue sauce, ribs, rice and beans. On the counter we noticed the Caesar salad sitting there unapologetically, ready-made in a plastic bag next to a store-bought pie pan of cornbread, still in its own plastic bag. My wife and I exchanged a lightning-quick glance once we had taken it all in. The glance was undetected but conveyed a novels-worth of commentary. We continued our lavish praise for sparing us the task of cooking our own dinner that evening and the luxury of their wonderful company, while inside our heads we reflected upon each other's Blitzkrieg of opinions. Homemade!? The only thing made from scratch here are our own thoughts as we scratch our heads wondering who could invite guests to eat TV dinners? This is what we were expecting. 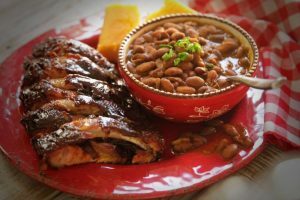 Something akin to these amazing ribs with Elizabeth’s Perfectly Pink BBQ Beans and cornbread. In no time at all; how else could it have been since dinner preparations took literally no time at all, we were around the table thanking God for his many blessings and settling into our individually nuked ribs with rice and beans. I could not resist making the comment, “There's nothing like good homemade cooking!”. My wife, anticipating the punchline, “...and this is nothing like good homemade cooking...” managed a swift kick to my shin under the table, forcing a retreat from the punchline I had no intention of delivering, but instead caused me to exasperate, “OOOOOH! THIS IS DELICIOUS!! !”, resulting in a brief but sudden and suitably awkward cessation of activity around the table. Eating resumed. By the second or third bite, even through our pervasive culinary snob-fest, we were sucker-punched by the unexpected. The food was delicious. The meat was falling off the bone. The rice was tender and flaky. The beans were lightly seasoned with ginger and garlic with just the right amount of chopped peppers and onions. I don't know if anchovies were blended into the salad dressing or not, but I could have sworn they were. The croutons were crunchy and the leaves of lettuce cool and crisp. The cornbread was mildly sweet and moist. My wife and I exchanged another quick glance, also undetected by our hosts, which conveyed a sequel to our previous novel. This time however, the plot therein was much less certain of itself and in fact conveyed not only confusion but indeed a certain amount of alarm. Assuming our hosts must also be experiencing this sudden epiphany I couldn't help my next utterance, “This is actually delicious!”, followed by another swift kick to my shin, followed by another overly enthusiastic,”OOOOH, SO DELICIOUS!!!! !”, followed by the second awkward silence; interrupted only by one of our hosts remarking, “...and this beer is the perfect compliment”. With painful humility I realized then how our own contribution wasn't exactly made from scratch either. Early on in the web development world everything was made from scratch. There was a great deal of pride in the 'Little House on the Prairie' way of getting things done. When Caroline Ingalls served baby back ribs you can bet not only did she make them from scratch, but she raised the pig and fed it the corn that was grown on their own farm. But did it taste better than the dinner our friends served us? Not only will I wager that our meal tasted better than Mrs. Ingalls’, but I'll bet the two efforts left our hosts more relaxed and rested and better able to tend to their guests. By comparison, Mrs. Ingalls' method certainly left her too exhausted to even eat her own dinner as she glanced around the kitchen at the pile of dishes she would need to take care of before heading out to slop the following night's entree. And so it is with web development nowadays. With great pride the web developer enjoys creating, for example, associative databases and linking them to several ports of entry, including manager access, admin access, user access and so on. It is empowering discovering what can be done from scratch. But as in the case of our delicious baby back ribs, rice and beans dinner; humility sets in as the developer realizes this functionality has been developed many times before with greater efficiency and with more features. Truly homemade programming does not make for better software, and in fact can leave the web developer exhausted, distracted and less able to serve their clients. In order for technology to progress as quickly as it does, it is necessary to trust the work of others and to build upon their successes. In the case of our homemade dinner, our hosts did not raise the pig nor the corn nor the wheat nor the lettuce. Instead, they shared the knowledge they obtained through the trial and error of combining various pre-made foods. They learned that this microwaved entree went well with this Caesar salad and this particular cornbread. Nowadays the web developer should be expected to know which pre-made widgets and digital components work best and in which combinations; which shopping cart is best supported by which membership management software. There is still plenty of exploring and pioneering to do, and plenty of widgets and digital components to develop from scratch. 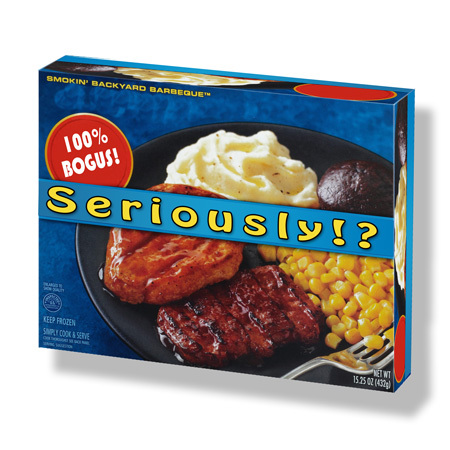 The trick is knowing when to use a TV dinner. And with that out of the way, let's contradict the whole point of this blog with a recipe of Vermont Maple Baked Beans. There is not, and never will be, a TV dinner version of this experience. My father, Poppy, would make these beans using an English oven called an Aga. Each year around the time autumn gave way to the first signs of frost, the beans would return: https://newengland.com/today/food/maple-baked-beans/. 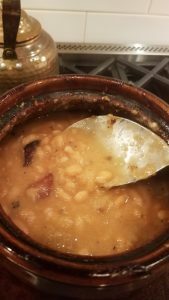 These beans would slow cook all day in a ceramic crock as the aroma of salt pork, onions, cloves and maple syrup wafted through the house with increasing intensity, reaching a zenith right on time as guests arrived for dinner, lager in hand.